I've long thought that economies would collapse if we don't curb CO2, limiting further rises in greenhouse gases. (That's not counting the natural sources that will be released in a hotter world.) At some point, if we don't limit CO2 enough then the cost of climate disasters will become so great that it will prevent further economic growth. It will lead to at best economic stagnation but more likely collapse. This is if we don't manage to cut CO2 emissions quickly enough. It may well happen in some countries anyway. Various organisations have identified the countries most vulnerable to climate change - mostly on the basis of their inability to afford to recover from climate disasters or adapt. On land, mammals were a small and still relatively minor component of the fauna. Early marsupial mammals evolved in the Early Cretaceous, with true placentals emerging in the Late Cretaceous period. The fauna was dominated by archosaurian reptiles, especially dinosaurs, which were at their most diverse stage. The seas were hot and high during the Cretaceous. 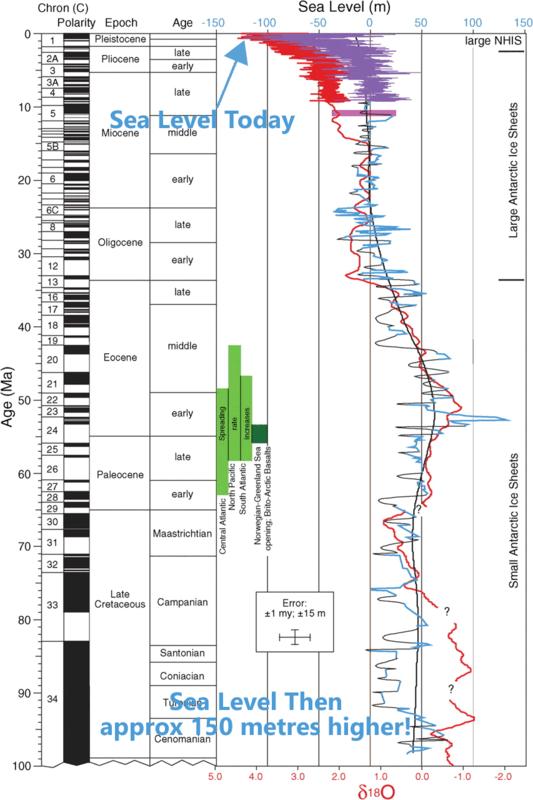 Litter et al (2011) suggests that in the early Cretaceous, seas were much warmer than today - up to 10°C hotter at the equator - and much, much more at higher latitudes. Imagine how that would affect modern marine life. We're worried about a sea level rise of a metre or two this century. Even if spread over millennia, societies would find it very challenging to adapt to a 150 metre rise. Remember too, that the ecosystem pretty well collapsed at the end of the Cretaceous. It couldn't cope with the (probable) meteor strike. There was a massive extinction when conditions changed. Similarly, when the relatively stable conditions we've enjoyed for the past 10,000 years or so are given a big shove, like we're doing - then many species won't be able to adapt in time and will become extinct. Alarmists are admitted misanthropes. This is exactly what they desire, so they write about it. Dennis Bird said he sent an abusive email, I think to Christopher Reyer, rather than Eric Worrall. I have sent him a one word email – Dummkopf! l would have thought that there would be a greater risk of economic collapse if the global temperature fell by 2C. After all the White House was blaming the weaker US economy on the cold winter. Christopher Reyer’s sciencey veneer is wearing off and all that is left is a misanthropic hunger for dead and suffering people. And your point is? Are you saying that not one species alive today could live with a 2C increase in the AVERAGE temp? The tropics then would be the same temp as the tropics today. The only thing that actually increases in temperature, increasing the average, is shorter milder winters. Of course, this is completely ignoring the solar predictions of the next 20-30 years of global cooling as we move into solar cycle 25. ...Exasperated, I dug further. What does '5-sigma' mean? "It's quite clear that temperatures will be warmer," Reyer said. By way of comparison, he explained, the 2003 heat wave in Europe [in which an estimated 70,000 people died during a 2.3°C hotter-than-usual summer], was only a 3-sigma event. The UN has already stated their goal is the collapse of Capitalism. Agenda 21 spells it out. The IPCC has also stated it’s not really about temperature but instead about facilitating the take down of Capitalism by eliminating fossil fuel use. I doubt the world will allow that to occur. Forests disappearing as people burn them to create energy will be the first unintended consequence. Think Haiti. I’m probably too old to see what becomes of this well orchestrated attempt at ideology implementation but I’m confidant the people will figure it out. Even IF (big IF) pCO2 continued its 2 ppm/yr increase, we are 650 years away from 1700 ppm. By then (if as some posters here are correct), the sun may be in another Maunder-like minimum. We would need all the warmth we could muster to prevent 50% of the world’s population from dying off. Of course that 5 billion human die-off is what the Agenda 21 eco-terrorists want. The most productive regions of the world, food wise, are the tropics. Indonesia, with a land area of 1.9 million square kilometres, 1/5 the size of the USA, supports a population of 237 million people – many of whom survive by subsistence agriculture. If the USA had a similar climate to tropical Indonesia, it could potentially support a population of 1.8 billion people – even using the subsistence agriculture employed by many Indonesians. Perhaps like me he's seen the hand-dug dry rice terraces outside Ubud, Bali, and like me thought them both amazingly aesthetic and functional. But wait a minute, what's this talk of subsistence agriculture he's talking about? The whole idea of drill baby drill isn't about subsistence, it's about GROWTH! I also wonder if he's ever sat in the back seat of a taxi in Jakarta looking on in 1st World horror as an 8 year-old child scurried around barefoot in traffic selling trinkets and what-not to stopped motorists with his 3-year old, also shoeless, sister in tow? Or watched from an air-conditioned hotel room as the trains creep along at < 20 km/h into/out of the central business districts during rush hour with nearly as many people sitting on top of (if not clinging to) the cars as are jammed inside? And just where are the Indonesians going to go live when the temperate regions of the planet are as hot as equatorial countries are today? They're closer to the Outback -- is it predicted to get more rain? I didn't think so. And certainly not any less hot. Does he have any friggin' idea how flat-out bonkers most Americans would go having a similar population density combined with such an impoverished subsistence economy? The comment thread is just downhill from there. I think perhaps people shouldn't casually fling the word "misanthrope" around until they've actually looked up the meaning of the word. Eric is just following in the footsteps of Carboniferous fan Viv Forbes, who never saw a giant millipede he didn't like. Thank you for lowering my IQ another 10 points, Russell. Why ... WHY! ... does silly tripe like that work?! "What these people dont get is that an increase of even 4C of the AVERAGE does not mean TMax is what increases. But that’s what they are basically saying. You can have summers the same as now, but shorter milder winters and get a 4C increase in the average, without additional heat waves. I fail to see how shorter milder winters, a longer growing season, less energy to heat our homes, is a bad thing…"
The comments betray a level of stupidity that seems appalling even by the standards of WUWT. My first thought was that the Koch Muppets are out in force today. Then I thought maybe Hilary's announcement has gotten the Tea Partiers all stirred up. But then, on consideration, Koch Muppets and Tea Partiers are the same thing. The dinosaurs get really upset with me from time to time, it appears. This has occurred over and over again for probably four years. Smokey, DBS (Da Bullshyt Spreader) gets a snootfull of my pointing out this or that problem with a conclusion from a guest post or actually running Reflubitcans down and they put me in heavy moderation or ban me for a while. Then they get pumping the flying monkeys up on a ridiculously big rant for a while and fix it where I cannot comment to show where they'd be wrong. Not quite Neal Stephenson's alternative spelling, but curiously close. Every WUWT article is different. One minute an ice age is coming, for sure - any day now. Next minute we're heading for six degrees of warming, but that will be a good thing - so they say. And in between "it's happening" and "it's not happening" and "it's the sun" - global warming has paused, or stopped, or gone backwards, and if it hasn't - they'll still be able to buy their fish'n chips - or so they say. Not to forget that smog is good - bring on the smog sez WUWT. We don't need no clean air regs. and the temperature record is terrible except they want to prove a point. Tisdale today thought that temp rising fast, then rising not so fast, means something different than that it is still trending up. Yes I saw Bob Tisdale up to his old tricks again. I know he is a fraud - if you point any problems with his calcs or reasoning, he either responses with nastiness or with something that does not address the point you are making. He was having to admit temperatures are increasing according to most of the temperature datasets - they can't cover that one up (only Monckton is still trying to flog that dead horse - even Dr Curry in her hearing testimony yesterday says temps are increasing). Those monthly temperature updates have now definitely switched from reporting a pause to reporting a difference between models and data - as predicted by Sou last year. WUWT-ers do seem to have a fondness for dinosaurs - you might call it kinship. I do so love it when you say things I've thought to say but didn't. I find it ironic the deniers will dispute temperature data derived from proxies several hundred years old (LIA, MWP), but will happily treat estimates from tens of millions (or even billions) of years ago as fact. And the tens of millions years ago estimates are only averages anyway - there could have been significant changes up and down in that time, they may not show because the resolution of a temperature record that old is too low. No, that is for donkeys! I think I invented "DuKE", but I think there are some excellent suggestions here for dinosaurs - especially "delingpole", "extinction" and "exeunt". I was thinking "coal seam" but I don't think it has quite the same ring.